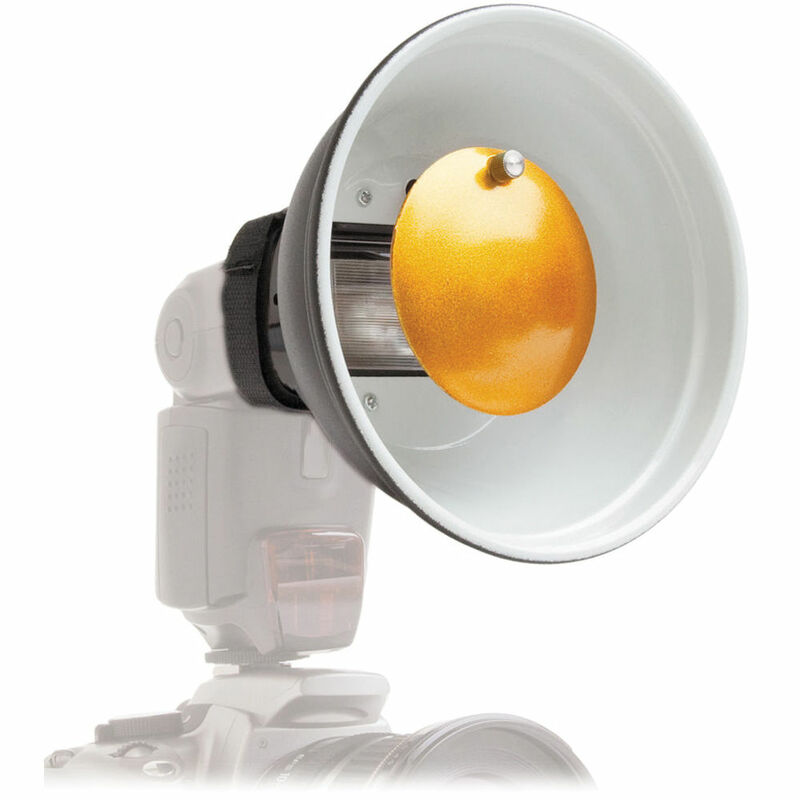 This Strobros Beauty Dish Version II for On-Camera Flash from Impact is part of their Strobros line of accessories for on-camera speedlights. Using a combination of touch-fasteners and variously sized spacers you can attach it to the head of most on-camera speedlights. The 6.0" beauty dish spreads the flash output to produce softer shadows and a more uniform spread of light, while the different colored reflectors can be swapped out to change the color temperature of the light produced. This light is much more flattering than the harsh light produced by a bare flash, which is why it's referred to as a beauty dish. The package includes the 6.0" beauty dish, four spacers in two different sizes, an instruction guide, and three colored reflector discs for the interior reflector (silver, soft silver and soft gold). An accessory set of honeycomb grids, color filters and a neutral filter is available, and sold separately. Box Dimensions (LxWxH) 9.35 x 9.15 x 6.3"
Strobros Beauty Dish Version II for On-Camera Flash is rated 4.3 out of 5 by 53. Rated 5 out of 5 by Saad from Great value for money! This is a very good addition to any photographer's lighting kit on the go. The soft lighting attained with it adds a beautiful touch to every shot captured. There is a good variety of warm and neutral tones for light bouncing. Pros: It's very easy to install. The build quality is not bad either and at such a low price point, it is a very valuable addition to a new rig.Cons: The only con that I can see so far is the fact that it can slip off during use; especially if the camera is faced downwards. It does have velcro straps and rubber studs to help keep the unit in place but that can still cause it to slip off the front of the flash. Rated 4 out of 5 by Frank from Surprisingly good This little beauty dish packs a punch. I tried out a friend's and was very impressed with the output and the quality of light. I used it on camera and off with great results. When your out on location and can't pack a lot of gear, having this for your speed light really comes in handy. And for the price, its a no-brainer, I ordered mine right away. The pros: inexpensive, light, and does a great job. The Cons: The only negative I can say is I wish they'd include a diffusion sock for it, but with a sheet of paper towel or other translucent paper and a rubber band you can make your own that works very well. It's a great addition to your speed light kit. Rated 2 out of 5 by audiotruth from Very flawed piece of gear. If you have read any reviews of this beauty dish casting a bad shadow in the middle of whatever you're shooting, take that to heart. It renders this item essentially useless. The shadow in the middle is obvious. Which is the exact opposite of what one would by this for. I sent the manufacturer an email asking if there was a solution to the problem that I hadn't thought of.... that was 3 weeks ago, no response of any sort, which was another knock on that company that I had read over and over. Should have listened..... bad product and zero product support. Rated 4 out of 5 by Mark from Great Beauty Dish Does a fantastic job on head shots! Dont expect to shoot anything other than a head shot though. The center of your shot will have a shadow from the center reflector! This device does not distribute light evenly on any shots wider than a head shot. Rated 5 out of 5 by crisderaud from Excellent flash modifier I use this for fill flash on product/stock photography where objects are in front of a white background. The combination of this modifier plus Impact's Fluorescent Two-Floodlight Kit makes for a usable light system that brings consistently good results. It mounts easily and securely. The weight is not a problem when mounted on a tripod in a home studio. If you need a little bit of fill flash at a close distance this is a good purchase. This bounces the light rather than shooting it through a diffuser which gives you a more useable fill flash and better control of the direction. Rated 5 out of 5 by Bob B from Works great! I recently purchased a soft box set up for my SB900 flash. I purchased this as a throw in at the last minute. Mainly because of the price and the potential gain. I am very pleased with the results. I have a beauty dish in the studio and the results are similar. It disperses / softens the flash and creates a more even light making it much more complimentary for the subject. The portability of a little beauty dish is great. It fits on the flash well and the velcro helps to keep it on.The SB900 flash is known to heat up and shut itself down. Especially with the plastic dome or other attachments on the end of it. This did happen to me with this on. However, it was while shooting several individuals, baseball teams, one right after another so this is something to pay attention to. I did a portrait session with 2 young ladies and this was not a problem at all.Overall I am impressed with the results. It's very convenient to have a little portable beauty dish to bring along. Rated 4 out of 5 by Guest from Nice light, but needs a diffusion sock I used this for a wedding a day after I received it, It worked well for the interior shots but not great outside in bright conditions. Impact should have an optional diffusion sock for this. Their smallest sock is an 11. I found a 7 Soft White Diffuser Sock that works beautifully, Just needs slight modification to fit tight. Rated 5 out of 5 by Orlando Dean from I just used this on my SB900 flash. It fits nicely onto my SB900 flash. I like the looks I got on a portrait session. Very flattering light. I had to up the power a little to get the light I needed but the Strobros Beauty Dish does just what I wanted it to do. I like the interchangeable discs that came with it for different colors of light also. Hi, will this fit my sony HVL F43M flash ? Yes. The Impact Strobros Beauty Dish Version II includes four (4) different Velcro attachment spacers to ensure the unit will have a secure fit on your flash head. You would simly have to test to see which of the included spacers provides the best fit for your flash head inside rear of the the beauty dish reflector. Are there any grids for this products? Preferably 10 degree grid. Will this fit on a NIkon SB-910? Yes, this beauty dish will work on a Nikon SB-910. Yes, the Impact Strobros Beauty Dish Version II for On-Camera flash is compatible with the Canon 60D and Nissin Di466 speedlite. Is it compatible with the yongnuo yn560 flash? It will fit any flash. Yes, it is compatible with the 580EXII. Hello there!What material is this small beauty dish made of?Thank you! Not really sure what to call it but it does feel durable. Its not plastic. Feels like a strong and durable bowl.